Being involved in organised “Leonard Cohen fandom” is a bit of a curious thing. It’s at once an intensely personal thing – sharing a passion for Leonard Cohen’s words and music – and also a strangely social one. There is something about Leonard’s fans which makes meeting them at once humbling and intriguing. I don’t know whether it’s the tales of extreme pilgrimages that have been undertaken, the intensely personal stories of what a certain song has meant, or something else entirely. But there is definitely something curiously “affirming” about gatherings of Cohen fans. This immutable fact was brought back to me last weekend as I attended the 2nd Annual Adelaide Cohen Event. Readers of this forum may recall that in January 2012 a small gathering was held in Adelaide (South Australia) – beneath a balmy summer sunset – to celebrate the life and music of Leonard. This event was organised primarily by Alan Mawhinney (AlanM from this forum). So successful was this convocation that a decision was made to hold another such event – in January 2013. The date was set for the weekend of 5 January. While it would be accurate to say that once again the organisation for the 2013 event was undertaken by Alan that would significantly understate the amount of effort that he put into this endeavour. Early in the planning stages of the event a decision was made to grow the event from a one-evening gathering to a two-day event featuring a half-day bus-trip to the site of Leonard’s celebrated winery concert in 2009. This significantly increased the amount of organisation required … but still Alan took on not only the lion’s share, but in reality the 99% share of the task. The effort he put in across the many months leading up to last weekend truly was Herculean. Also, the behind the scenes work put in by Alan’s wife Karin to coordinate food and drink on the day are worthy of special note – they were truly remarkable. One of the benefits of a longer event was that we were able to entice one of this forum’s most esteemed Australian fans – Andrew Darbyshire – to travel across from Melbourne to take part in the festivities. This was a huge boon: Andrew is both incredibly knowledgeable and very passionate about all things Cohen, not to mention an entertaining speaker on the subject. I truly cannot thank him enough for making the trip to attend the Adelaide Event. The Event, Day 1 – Saturday 5 January, 2013. The Saturday programme revolved around an evening gathering at Alan’s house, nestled in a leafy hillside suburb. The basic plan was to run a similar format to that which had been so successful in January 2012 but to attempt a few more ambitious things such as interactive quizzes and a live musical performance. I arrived at Alan’s house a little after 2PM and the organised programme of music and video presentations were already underway. It was a bright sunny afternoon, but fortunately there was plenty of shade around Alan’s backyard entertaining area. He had, in conjunction with Mel – a fellow Adelaide Cohenite and professional musician – rigged up quite a serious-looking sound system just inside the little “summer house” which faces onto the patio area which was to be the main “convention hub.” This audio equipment was plugged into a large-screen TV positioned so as to be out of the direct sun but still visible to everyone. To be perfectly honest, the sound system looked a little frightening in terms of its possibilities for extreme volume ... but careful mixing kept the sound to a low, if somewhat bass-enhanced, level that was audible to everyone but which didn’t hamper conversation between fans. Alan had also taken the expedient measure of inviting his neighbours (who are themselves Cohen fans) to attend ... so even when things got a little louder later in the evening, there was little chance of causing consternation to the neighbourhood. Alan had organised the playlist of videos and audio for the afternoon and evening, and in doing so had carefully put together a program which highlighted some of the newer songs performed live in 2012 and some of the songs which had evolved over time. I thought this was a very clever choice of material since it minimised overlap with videos and audio curiosities which were the focus of the 2012 gathering and gave the assembled fans a bit of a taste of the “new sound” embodied in the 2012 World Tour performances. Since almost all the eighteen fans who attended the gathering were also at the 2012 event ... and few of them had seen YouTube footage from the latest concerts, there was plenty of interest in the material played. The next video presentation was something intriguing that Alan had been working on for a while. It was a short mini-documentary that he had researched, written and composed from a variety of videos and stills. Oh, and narrated too. The subject of the documentary was “5 Suzannes: Two poems, one song and two women”. It traced the origins of the song lyrics which we all know as “Suzanne” from their first publication in “Parasites of Heaven” (along with an entirely different poem about Suzanne). The documentary included lots of information about the woman, Suzanne Verdal, on whom these poems were based – including her somewhat less than comfortable later life. To stave off the inevitable questions, the doco also spoke about the OTHER Suzanne (Elrod), mother to Adam and Lorca. All in all I thought this was a really well-done featurette and was obviously a labour of love for Alan. But more importantly, the stories and music in this short video were of great interest to those attending the event. It was like a pause, when all other conversation stopped for a few minutes as we all listened – and (even us long-time fans) learned something about the remarkable lineage of the words to this song. Not long after this, the first of the evenings several “Quiz” spots was held. For this first segment, the three “experts” in attendance – myself, Alan and Andrew – put our knowledge of Cohen lyrics up for quizzing by the assembled throng of event participants. Books of lyrics were passed around and people were encouraged to pick out obscure lines, which we supposed-“experts” were supposed to match with a song and write down its title. I knew ahead of time that this was going to be the first quiz of the night … and also that I probably wouldn’t do all that well. After all there are SO MANY words in the collected back catalogue of Cohen songs that it’s hard to have them all fresh in your mind. Thankfully, nobody took it too seriously – it was a very jovial atmosphere as folks relished our discomfort. In the end, though, it was a very close race – with Alan and I just narrowly beating Andrew. By prior arrangement there was no prize for winning … but the prize for losing was having to cook the Barbeque. In the end, though, a couple of volunteer chefs relieved Andrew of this duty, but the worry was etched on his face for a few minutes there. The next segment was Andrew Darbyshire’s recounting of his experiences attending two concerts on the 2012 tour in Europe (Bucharest and Istanbul). Andrew’s account was quite riveting as it included lots of information about set-lists and the instrumentation which makes up the “new sound.” But it also focussed on the human element – what it was like to attend a concert in another country, with a local fan as “guide”. This was one of my favourite parts of the evening as, what began as a pre-prepared talk devolved into a much more free-flowing question and answer session. Clearly people were intrigued to know more about how the 2012 concert experience differed from what they had previously experienced in 2009 and 2010 and Andrew’s easy and informative style made his concert story (and a few other Cohen stories as well) a joy to listen to. Alan then played the YouTube video in which footage from “Downfall” (scenes of Hitler in a bunker) are overlaid with subtitles in which he berates the assembled Nazis about their failure to secure tickets to a Leonard Cohen concert. This received lots of laughs. The second quiz section followed – this one something that all attendees could participate in. 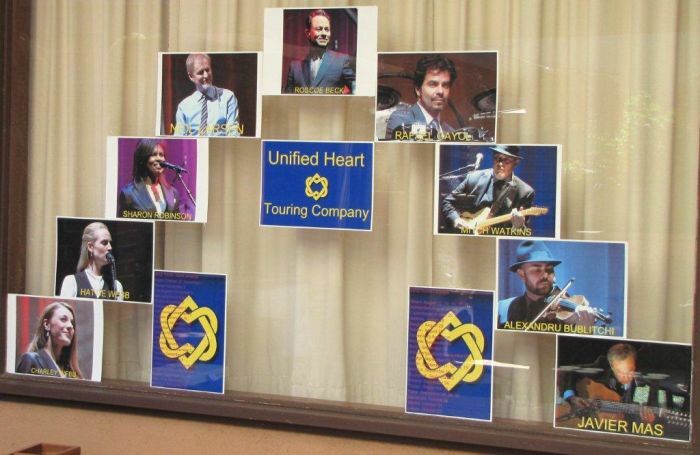 Alan played a 15 minute edited highlights of “Leonard Cohen – A Life In Art,” the recent press interview of Sylvie Simmons (Cohen biographer) and the assembled Unified Heart performers minus Leonard. At the end of the video presentation, Alan handed out a series of multiple choice questions relating back to some of the anecdotes which Sylvie and the band related during the interview. The questions were (thankfully) pretty easy … and the prize (a copy of Simmons’ book) was won with a perfect score! A lengthy break then ensued during which a ridiculous amount of food was cooked, prepared and eaten. Conversations drifted backwards and forwards on any number of topics, Cohen related and otherwise. There were three organised events after dinner. The first of these was a quiz which Alan had devised around the idea of picking song choruses from audio played in reverse. He played a clip in which the choruses for all the songs in the quiz were played in their normal (i.e., forward) direction. He then played the reversed versions of those clips in a randomised order and asked everyone to guess which song was which and write their answers on a piece of paper. I’d have to say it was a lot harder than I thought it would be … but it was also a lot of fun. In the end the prize (a copy of the “Cohen Live” CD) went to a team of folks who had decided to pool their guessing resources together. A little while later, the fourth and final quiz was run by Alice, one of the new attendees for the night. This quiz revolved around guessing a series of numbers that were somehow relevant to Cohen – for example, the year the “Songs of Leonard Cohen” album was released, or the total number of concerts in the 2008-2010 tour. People could call out answers and Alice – as quiz-master – would say “higher” or “lower”. While a little chaotic, this quiz was also a lot of fun … and it was made more so by the brilliant prizes which Alice herself had provided. The first prize was a framed concert poster from Cohen’s 1972 tour of the UK; second prize was the poster from Leonard’s 2009 show in Adelaide; third prize was a book of Cohen lyrics. All fine prizes … but one, in particular, seemed to particularly pique Alan’s interest – the UK tour poster which advertises a show which he had actually attended. With such great prizes on offer, the competition was indeed fierce, but in the end Alan did indeed walk away winning his dream prize. It’s strange, but sitting out in the open air in Alan’s backyard – the sun had long since set by then – listening to Mel sing these great songs, really reminded me of some of the best of the outdoor Cohen concerts I’ve had the privilege to attend. The small crowd was enraptured by his mellifluous voice, and the magic of the lyrics. To add a uniquely Australian touch, I noticed that just prior to Mel taking the stage (continuing throughout his set), a group of baby rose cockatoos had started up their faint but distinctive “begging for food” cry in the enormous gum tree immediately behind Alan’s house. Perhaps less distinctively Australian but amusing nonetheless, were the sounds of the household’s new baby puppy, who decided that Mel’s set was an ideal time to begin making cute yapping sounds from deep inside the house (where it had been sleeping). Last edited by dce on Fri Jan 11, 2013 9:01 am, edited 1 time in total. The Event, Day 2 – Sunday 6 January, 2013. The second part of the two-day Adelaide event was taken up entirely by a half-day bus trip to the McLaren Vale wine region south of Adelaide. 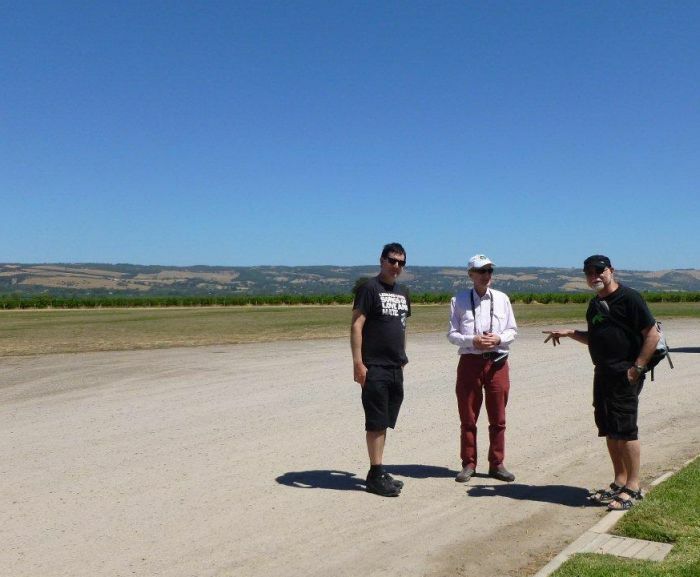 It was at a winery in this beautiful area that Leonard had performed in January 2009 (incidentally, my first LC concert experience). The plan was to re-visit the “hallowed site” of this concert – which many of the event attendees had also been at. Along the way we would stop at a few other of the (many) incredible wineries in McLaren Vale and sample some of the local produce. Ten of the folks who had come along to the first day’s celebration also came along for the bus “pilgrimage” plus we were joined by one additional fan that hadn’t been at the Saturday night event. So, all in all, there were eleven of us who braved the ordeal (;-)) of a beautiful sunny day touring around the local wineries. The schedule called for us all to assemble once again at Alan’s house at 11:45AM for us to meet with the bus and depart at 12:00 noon. Clearly everyone was enthusiastic about the trip, since not only was everyone assembled on time … but indeed the group was ready early. So when the hired bus arrived at the end of Alan’s driveway we all quickly piled on and we were away a little ahead of schedule. Although I didn’t know it ahead of time, the bus driver that Alan had arranged for the tour was actually someone he knew socially. This lent the trip a bit more of a warm “homely” feel to it, which seemed sort of appropriate for a Leonard Cohen gathering. Alan had brought along his CD of “Songs From The Road” which he played through the bus’s sound system ... so the sounds of Leonard were with us all day as we travelled around. The trip down from Adelaide to McLaren Vale went by remarkably quickly. I took the opportunity to speak a little more with Andrew from Melbourne, learning a bit more about what he had been up to in his few days in Adelaide ahead of the event. He hadn’t visited Adelaide before (not surprising – although a pretty place, Adelaide isn’t particularly on the tourist map ... well except the WINE touring map). But he seemed to be having a good time. He marvelled at how dry everything looked and how many old and abandoned farmhouses we passed as we wound up through the hills towards the wine region. The first stop was at a winery called Woodstock – Alan had pre-arranged for us to have lunch at this spot, in a beautiful outdoor courtyard garden. But before sitting down to our gourmet platters everyone was eager to try some of the local wine. Curiously, the cellar door at Woodstock is a fairly small building ... so much so that our little group of eleven mostly filled the room. Fortunately the staff were, however, very attentive and plenty of wine was made available for us to sample. Some of it was really good, too. The outdoor lunch was a wonderful and relaxed meal. The group was small enough that it felt like just a group of old friends sitting around “shooting the breeze” – even though some of us had only recently met. Glasses of Rosé were lazily consumed; gourmet pâté and other antipasto dishes were relished and savoured. The conversation shifted across a multitude of topics. A little after 2PM it was time for us to leave for our next stop of the day, another winery called Scarpantoni. As the name suggests, this was a place which makes Italian-styled wines ... and had a cellar door to match, complete with an outdoor seating area fringed by a colonnade of archways. A few folks made straight for the rustic tables in this courtyard – the rest of us went in to try the wine ... but we all ended up around the old wooden tables in the end. After finishing at Scarpantoni, the final winery stop of the day was at Leconfield which was the site at which Leonard had played in 2009. I’ve actually been back to this place once already since then … and truth be told it doesn’t really hold much intrinsic “magic” as a place (indeed, stripped of the huge stage, seating, vending stalls and crowds of people the concert site looks just like any other flat expanse of grass). But coming back here certainly does bring back memories, and it gave everyone a chance to re-live their anecdotes from the concert. We did take the opportunity to snap a few group photographs just to record the occasion. More wine was tasted inside the Leconfield cellar door and, while exploring the building, Alice chanced upon a wall where the winery had hung signed posters from each of the concerts they had hosted. So ... in pride of position we could see a beautifully framed “Leonard Cohen—A Day On The Green” poster inscribed by “Our Man” himself. A few of the more scurrilous members of the group light-heartedly concocted devious ways in which this prized item could be purloined. Or maybe that was just the wine talking. We left Leconfield about 4PM and headed back into the main township of McLaren Vale. Most people by that point where keen just to get a coffee and chill out for the rest of the afternoon. So many of us ended up at a café / continental shop called “Blessed Cheese” where we commandeered a large table in a back room. Conversation, coffee, and fresh-baked muffins were consumed. Refreshed, we all returned to the bus for our return trip to Adelaide. As we drove back along the country roads, our rather joyous crowd of bus-trippers again enjoyed music from “Songs From The Road,” even joining along with singing for a few of the songs. It was a great atmosphere. Andrew asked whether there was some way we could detour on our return trip to drive along some of the beautiful beach scenery south of Adelaide. After some consulting of maps, a route was planned which took us along several different long sections of beach esplanade (Moana, Port Noarlunga and Christies Beach). It was a perfect day to see the beach – clear blue skies and light breezes. The azure waters glinted under the late afternoon sun. It was a little piece of magic. We stopped a couple of time so photos of the pristine beaches could be snapped. As we drove Andrew started scheming about selling up his house in Melbourne and coming to live by the beach ... well, it’s a great dream. Eventually, though, the day – and indeed the two-day Adelaide 2013 event – had to come to an end. The bus dropped us back at Alan’s driveway and most people went their separate ways with a promise to “see you next time.” Clearly everyone had enjoyed both days of the Cohen gathering – both the more organised Saturday night celebration of Leonard’s inspiring music and the more laid-back day of bus touring. I imagine everybody did what I did … went home and put one of Leonard’s CD straight on their CD player / iPod / whatever … and felt just a little bit more convinced of the power of music to bring people – even those who have nothing else in common – together. Thank you so much for your detailed report and photos on the Adelaide LC gathering. I always love reading your words; makes me feel a part of it. It was great to meet you in Brisbane in 2010 ...... seems so long ago! It sounds like I missed a fun time here. So sorry I couldn't make it. Amongst other things and as I explained to Alan last year I’m not a very good flyer and yesterday’s recent startling event here in Queensland just added to my phobia! Two of my worst panic instigators combined together, eek! ..... and no, for obvious reasons, I've never seen the movie! The below pic was taken on a flight from Cairns to Port Moresby. But back to the event. Once again, Alan has completed a great job as host and well done also to others who contributed. I know it was a labour of love for all of you. It would have been interesting to have met everyone. Let’s hope that will happen when Leonard finally comes to Australia. If some of you Southerners can get to the Brisbane concert, I will most certainly see you there. There is one thing I (tongue in cheek) just have to say. You’re all lucky I wasn't there because the "match the lyric with the song title" quiz I would have won hands down! I have had perfect training for that with years of playing the Picture Game on the forum! Maybe you should try what L*nc* Armstr*ng took and you could have been here in no time on your bicycle! I'm sure we're destined to meet in this life. Next time there's a concert in Brissie, I will definitely be along ... not just to see what Leonard sings, but also to answer the much more burning question ... what will Bev launch up onto the stage THIS time! Thank you Dean for sharing this wonderful report. I really enjoyed reading it. I would have failed miserably at the match the lyrics quiz as when I am put on the spot I get instant brain freeze. The “5 Suzannes: Two poems, one song and two women” sounds really interesting and something I'd have loved to have seen especially having been in Montreal and seeing our Lady of the Harbour. It is always special to return to memorable concert venues after the great event and the wine tasting to accompany it is just perfect. Haha, Alan, my pushbike tyres are a bit flat at the moment (from lack of use) so maybe next year I’ll catch the s-l-o-w train and that will eventually happen. And then you have to make sure that everyone who came this year will come next year plus more people! By my estimation, the 2013 tour will reach us after they've finished in Europe, maybe here in November/early December. Let’s hope I’m right. It will be great to make contact with you again in Brisbane! I would like to applaud Alan, Karin, Alice, Dean, Mel and everyone else who made the Adelaide event such an enjoyable experience. I would also like to thank Alan and Karin for accommodating me and their splendid hospitality in that regard. Furthermore, I must thank Alice too, for collecting me from the airport and taking me on a quick tour of some nice spots in Adelaide that same afternoon. Dean, your report was of the usual high standard and entertainingly so – good on you! My trip to Adelaide for this event was well worthwhile; I look forward to the next gathering there and/or perhaps even in Melbourne. One of the videos I prepared for the Adelaide event was a compilation video of (The) Darkness with segments of several videos taken by others showing the changes in the arrangement over time. The concert I managed to get tickets for was the one at Albert Hall, London. I always thought it was called Royal Albert Hall until I read this advert! Getting tickets back in the day was not easy. Getting there and getting home was quite an adventure too.